How to add USB PCIe card to your desktop PC? 1. The first step is to know what you need and get all the necessary component ready. 2. Shutdown your system and turn off the power. Unplug the power cord that goes from the computer to the wall outlet or your power strip. 3. Remove cover of the system to access the slot on the motherboard. 4. If your system have L bracket covering the slot. Get ready to remove one of them that align with the slot you are going to insert the add-on card. 5. Most motherboard have a few slots. They may be PCI or PCIe slot. If you are install a PCIe card, find a PCIe slot that is equal or bigger than your card. 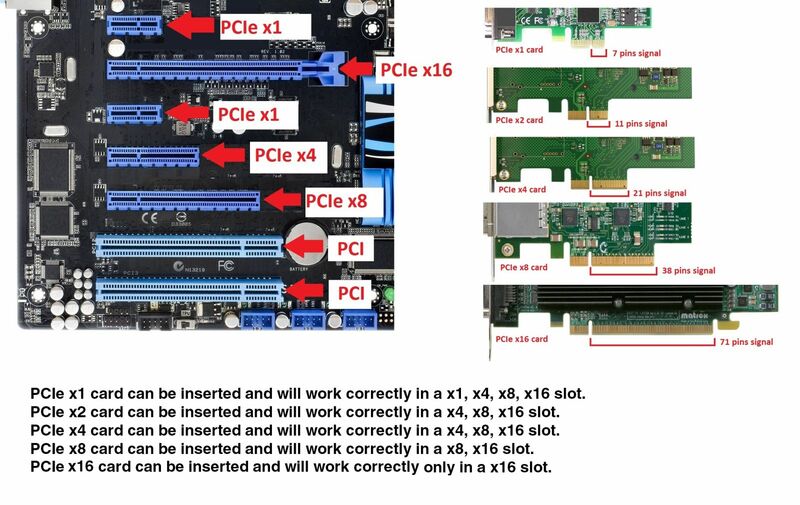 example: If you are installing a PCIe x1 card, it can be inserted into x1, x4, x8, x16 slot. But if you are installing a x4 card, it will have to go into a x4, x8, x16 slot. 6. Remove the L bracket align with the slot that you are going to inserted and insert the new add-on card into the slot. 7. Secure the card to the chassis using the instruction provided by the chassis manufacturer. 8. If the add-on card requires additional connection for power like 4 pin molex or SATA power connector, get the connect from the power supply and connect to the card. 9. Replace the chassis cover and secure the screws holding the cover. 10. Connect back the power cord and turn the power back ON for the system. 11. Follow the instruction from the add-on card install guide to continue the installation process. How to add a PCIe card to your desktop or Slim PC? 2. If your system chassis is a slim chassis design, your will need to replace the metal bracket with a low profile bracket. Follow the PCie card quick installation guide on replace the standard bracket with a low profile bracket before you continue to the next step. 3. Shutdown your system and turn off the power. Unplug the power cord that goes from the computer to the wall outlet or your power strip. 4. Remove cover of the system to access the slot on the motherboard. 5. If your system have L bracket covering the slot. Get ready to remove one of them that align with the slot you are going to insert the add-on card. 6. Most motherboard have a few slots. They may be PCI or PCIe slot. If you are install a PCIe card, find a PCIe slot that is equal or bigger than your card. 7. Remove the L bracket align with the slot that you are going to inserted and insert the new add-on card into the slot. 8. Secure the card to the chassis using the instruction provided by the chassis manufacturer. 9. (Optional) If the add-on card requires additional connection for power like 4 pin molex or SATA power connector, get the connect from the power supply and connect to the card. 10. Replace the chassis cover and secure the screws holding the cover. 11. Connect back the power cord and turn the power back ON for the system. 12. Follow the instruction from the add-on card install guide to continue the installation process.